James Ridgely Whiteman, a 19-year-old amateur archeologist from Clovis in eastern New Mexico, took notice of the fuss up north and started poking around his hometown. One day in February of 1929, Ridgely Whiteman was prowling along Blackwater Draw and, as he later wrote in a letter to the Smithsonian Institution, “found fluted points in association with mammoth bones.” He had come across what is now considered to be one of the most significant sites in human history. 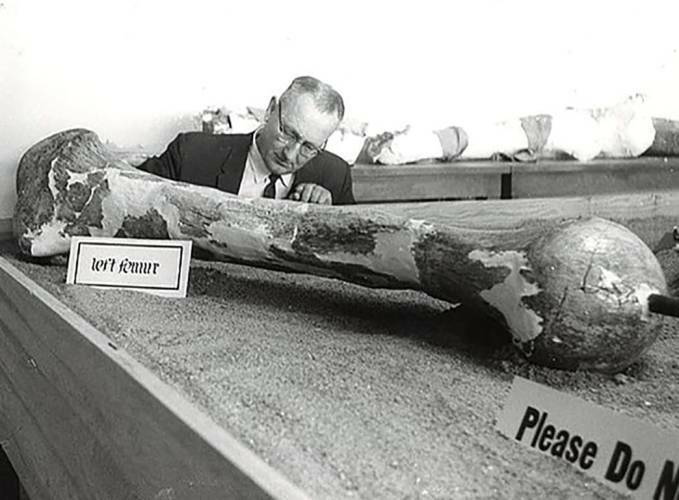 Recognizing the potential importance of his find, Whiteman fired off two more letters to the Smithsonian, but they were ignored until the New Mexico highway department, using horse-drawn scrapers to dig gravel from the site, uncovered piles of huge bones in 1932. Archeologists descended on the site and found, as Whiteman had said, ancient spearheads, stone tools, hearths, and evidence of almost continuous human occupation at the site dating back 13,000 years. Were the Clovis People the First Americans? The discovery of the Clovis culture in New Mexico pushed the settlement of North America back to what archeologists believed were the first people to cross a land bridge between Siberia and Alaska at the end of the last Ice Age. The ancient people then followed an ice-free corridor south and dispersed across the continent. For decades after the Clovis discovery, researchers thought that the Clovis people were the first Americans, but there is now evidence that pre-Clovis people arrived in the Americas in successive migrations as far back as 20,000 years ago. The Clovis people in New Mexico flourished on lush grasslands populated with mammoths, giant bison, dire wolves, camels, huge turtles, giant ground sloths, and the fierce saber-toothed tiger. The artifacts at the Blackwater Draw site attest to the skill of these early hunters as well as their advanced spear points, which were found in direct association with the bones of extinct Columbian mammoths. These massive animals stood 14 feet high, weighed 8 to 10 tons, and ate over 700 pounds of vegetation daily. The sheer number of bones at the Blackwater kill site indicated to early archeologists that the Clovis people were big-game hunters. The projectile points, attached to the ends of spears, exhibit impact scars made by thrusting and throwing against hard bone, while their stone tools display damage caused by butchering animals. That being said, few Clovis sites were big-game kill sites, reflecting that Clovis people hunted a range of animals including deer, rabbits, coyotes, and birds. The ancient Clovis people were food opportunists that depended on gathering the edible seeds, nuts, and roots of plants, fishing, and hunting small mammals for sustenance as well as taking down some of the larger animals. What is known about the Clovis people comes from the remains they left behind, which are mostly tools: scrapers, drills, blades, and distinctive leaf-shaped, fluted spear points called Clovis points. The exquisite four-inch-long projectile points, carefully chipped from flint, chert, and obsidian, have concave grooves down each side, sharp edges, and a lance-shaped tip. More than 10,000 Clovis points have now been found in North America from southern Canada to Central America, all dating from the same time. The oldest points, found in Texas, date to 13,500 years ago, while points found northern Mexico are approx. 13,390 years old. Researchers say that the Clovis culture swept across the continent in less than a thousand years, allowing native peoples to successfully live in different environments. Stone tools are more easily preserved than organic remains like clothes, sandals, and blankets, so little is known about the Clovis people except for what archeologists infer from the artifacts that have been found. What we do know is that they were undoubtedly nomadic people, roaming from place to place in search of food and living in crude shelters and tents or in shallow caves. Researchers have found five types of Clovis sites in North America—single kill sites, multiple-event kill sites, campsites, cache sites, and isolated artifacts. Clovis kill sites with spear points and isolated finds like an arrowhead in a cornfield are commonly found, while campsites with hearths and cache sites with stone tools are rare. Carbon 14 dating at the Blackwater Draw site shows that the Clovis people lived in the area for about 600 years, hunting animals that drank at a spring-fed lake and marsh, building campfires, and even digging a well, the first known water control system in North America. Later ancient people dug as many as 20 other wells here between 4,000 and 10,000 years ago. Beyond this evidence, nothing is known about the Clovis diet, what kind of clothes they wore, what they looked like, or their cosmology. Only one burial has been found, an infant associated with stone tools and bone tool fragments dated to 12,600 ago in Montana. DNA analysis of the bones revealed that the infant is an ancestor of modern Native Americans. What Happened to the Clovis People? The end of the Clovis age came about 12,900 years ago, but the Clovis people didn’t disappear. It appears that post-glacial climate changes, including a 1,500-year cold period, as well as the disappearance of the large animals (possibly due to an asteroid impact in Canada), forced native peoples to adapt, move to other places, and invent new technologies to survive. Researchers say other post-Clovis cultures like the one discovered at Folsom in northern New Mexico derive from the Clovis. The Clovis culture irrevocably changed Native American life in a short time span, flashing across North America with new and improved technologies that allowed people to flourish across the continent. Better spear points and arrowheads lashed onto wooden shafts were coupled with notched throwing sticks, called atlatls, which allowed people to efficiently hunt game. The Clovis tool kit allowed quick dismembering of animal carcasses and butchering the flesh at kill sites. The nomadic Clovis lifestyle, using hunting and foraging to obtain food, lasted thousands of years after the disappearance of the Clovis culture, a tradition that continued into historic times with Plains tribes hunting bison on the plains of eastern New Mexico. Visit the Blackwater Draw National Historic Site, located on NM 467 between Clovis and Portales in eastern New Mexico, to explore the site where the Clovis culture was first discovered. The area has changed dramatically since Clovis times, with a drier climate and the surface of the ground now 15 feet higher than it was thousands of years ago. A self-guided trail explores the quarry, with a large shed protecting excavations from weather and a smaller shed over the Clovis hand-dug well. Before visiting the site, stop at the Blackwater Draw Museum at Eastern New Mexico University in Portales five miles to the south and learn about the Clovis culture and the discovery and excavation of the Blackwater site.